McDonald's Chocolate Shamrock Shake is limited-time St. Patrick's Day layered shake with chocolate shake on the bottom and Shamrock Shake on top. 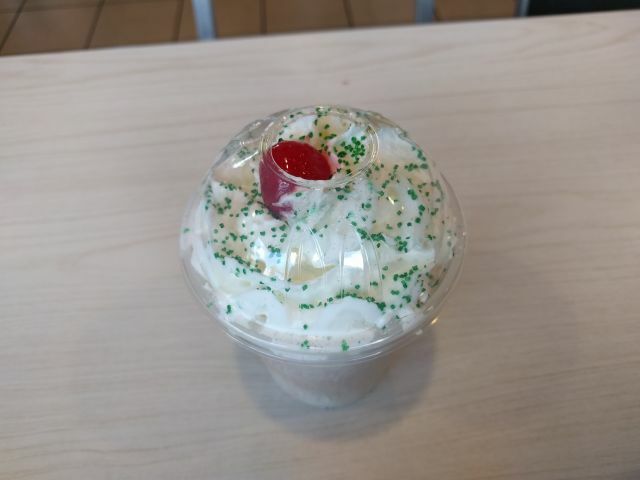 It comes topped with whipped topping, green sugar crystals, and a maraschino cherry. I paid $2 for a small shake. Despite the product description and the promotional pictures, my Chocolate Shamrock was not layered. The drink arrived quite swirled together, to the point that I thought they gave me a wrong order. The green sugar crystals add a nice bit of color but are otherwise unremarkable in taste. The shake somehow had very little flavor yet still managed to be extremely sweet. There was the light coolness of mint but none of the actual peppermint flavor like in the normal Shamrock Shake. There was only the barest hints of chocolate flavor as well; you really have to look for it. At best, I would describe it as a very mild cocoa with just a touch of mint. 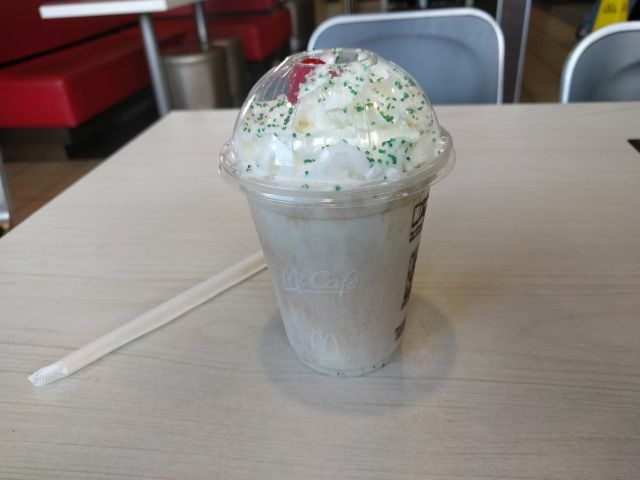 McDonald's shakes tend to be very thin and immediately drinkable, and the Chocolate Shamrock Shake was no different. It started melting fairly quickly, which probably contributed to the lack of layers in my particular shake. Overall, I was rather disappointed by the Chocolate Shamrock Shake. While I really enjoy the original Shamrock shake for its forward mint flavor, I found the chocolate version to be underwhelming on both fronts. I ended up buying a regular Shamrock Shake to satisfy my minty craving.